So we've talked about raising kids vegan since birth, transitioning kids to a plant-based diet, and handling social situations in Part 1 and now we're sharing tips and tricks for getting kids to eat their veggies! Before I let the Herbie Parents chime in, here are some experiences I have had with my nieces, nephews and friends' kids. First, it's important to remember that all kids are different. Anyone who guarantees a recipe is kid-friendly is a little too optimistic in my opinion. For example, I have 8 nieces and nephews: 7 like blueberry muffins, 1 does not; 6 like pancakes, 2 do not; 4 out of 8 like oatmeal. Even within the same family (each family has 4 kids), there is no consistency. Second, most kids (and teens) can be picky with food, even if their family is omnivorous. I find it helps to give them a choice — say a black bean burger orlentil tacos, vegetable soup ora burrito. Also, if they are old enough, talk to them about all the consequences of meat — the brutal death, the illness, the destruction to the earth. That there's poop in all meat and dairy (that one usually sticks!) and if you can, let them pick recipes from cookbooks they want to try — or have them help with cooking. That'll get them interested. Most importantly, be a good example! And I can't recommend our family meal plans enough for staying on track with healthy, kid-friendly menus. Leah F.'s Backyard Garden — planted by her husband and enjoyed by her Herbie family! Alright parents, share your tips for getting kids to try new foods? "Ketchup! A drop of the magical red stuff will get my boy to eat just about anything." — Lisa J. "I mixed spinach in with mashed potatoes, but not really because they wouldn't eat spinach...it was more because they didn't have their molars in yet, so eating greens was a little difficult. My daughters will usually try something at least once. They will try it again if they have forgotten that they tried it once." — Ashley S.
"They help pick our recipes. They help out with shopping and food prep. So get them involved." — Erica C.
"Kale and broccoli have been the only real struggle. We have found that if you mix it with applesauce or very ripe pears there is no objection." — Ashley M.
"As a compromise for my 3-year-old (which then also became motivation for my older 2), I made up a 'pizza and dessert chart.' Friday night, we do pizza, dessert and a movie IF they get all their checks during the week. Their checks are earned for trying mommy's 'icky' food. Twice a day (breakfast and lunch or dinner) they have to take a certain number of bites or sips. My 3-year-old has to take 3 bites twice a day. This practice is getting them all to try things they wouldn't otherwise try AND I know they at least have some of the healthier food in their bellies. I have also been trying to make sure I have 3 or 4 offerings at each meal." — Melissa A. "Make it, serve it. But do try to find things they have an interest in and get their help in finding new ideas. For toddlers: have good stuff available, offer, and let them make requests." — Ellen A. "It helps for her to see us eating it and enjoying it. And offer things to her repeatedly. Sometimes it takes a few tries. And they are constantly changing. One day she'll eat large amounts of one thing and the next week or even day, she won't touch it." — Betsy L.
“My standing policy (when my daughter was young) was that she had to try whatever I cooked. If she didn't like it, she got a PB&J sandwich.” — Terri J. "No pearls of wisdom here. We usually tell them, this is just like ....! You're going to like it! We are lucky that our kids are good eaters and are willing to try things. But that didn't happen by accident. My best advice for new parents is to never stop feeding them the fruits and veggies that they are giving them as baby food. Don't stop when they start eating finger foods or you'll never get them to eat broccoli when they're 5." — Kim F.
"When I cook a new recipe, I always ask that they give it a fair chance with a positive attitude, by trying at least a bite. If they don't care for it I am OK with that, I don't force them to eat it. The rule in our house is, "You have to try it. If you don't care for it, you may always eat as much fruit as you'd like." Once they try dinner, if they don't like it, fine. But I don't cook them something else. They peel a banana or have an apple. Everybody wins. I will almost always make a recipe 3 or 4 times (always requiring that they try it with a positive attitude) before I call it a wash. Sometimes they come around and sometimes they don't. I don't like being asked to eat something I don't like, and so I don't insist they do either. Fruit is always a healthy dinner, or anything from the garden." — Leah F.
What are some of your kids favorite foods? Any favorite HH Recipes? 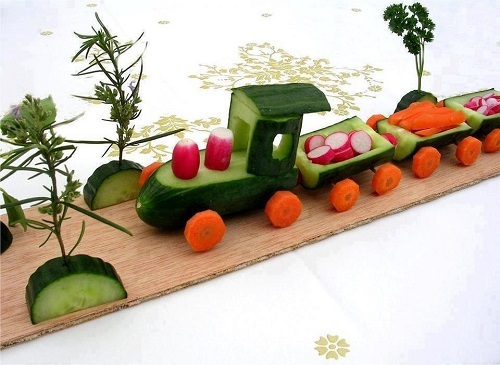 "My son (3) loves all fruits and vegetables. I mean ALL. He even eats beets! (bleech!) We are so blessed to have such an adventurous Herbie." — Lisa J. "Black beans and rice has always been one of his favorites. He loves HH mac and cheese. LOVE LOVE LOVES "bean cookies" (the bean cakes in HHC). He's totally a fruit guy. I'm not sure there's a fruit out there he hasn't enjoyed. He's also a fan of the HH chocolate zucchini muffins and banana bread out of FOK. Whole wheat pasta and marinara is another favorite (and always followed by a bath). Oh and how could I forget! The kid LOVES baked beans" – Tina M.
"My daughter's favorite food is probably either the HH Chickpea Tacos or the Quick Black Bean Burgers. We're also really into the HH cashew-based "cheese". It makes Taco Tuesday even more fun. :) [Editorial Note: Also try the nut-free, fat-free version of this cheese in HHC and HHA]. We also love the HH's Strawberry Cupcakes (HHC)." - Meredith L.
"Green Gobblin' muffins, Nachos with the HH Queso, Chickpea tacos, Hippie Loaf and the lentil loaf, black bean burgers. They honestly haven't disliked anything I've made from any of the HH cookbooks." — Erica C.
"We love Engine 2 raise the roof lasagne, HH cookies, muffins, smoothies, vegetarian/Buddha's delight, black bean and salsa soup, nacho cheese (cashews) worked great on pasta, bean/veggie burgers, and chickpea tacos." — Ellen A. "They really like the HH Quick Burgers, and we make those often. They also loved your apple crisp muffins, crustless pumpkin pie, and the pumpkin bread and banana bread as well." — Leah F.
"Ratatouille and pasta with veggies mixed in are the only things my daughter eats in large quantities for periods of times. She likes a variety. She loves olives. And I made HH pumpkin bread a few weeks ago and she loved it! — Betsy L.
"They are really good at feeding themselves with a spoon now, so farina and oatmeal are popular. One of the first table foods they had were HH pancakes. They loved it! I make a version of the breaded zucchini for them and they went bonkers for the zucchini-chocolate muffins." 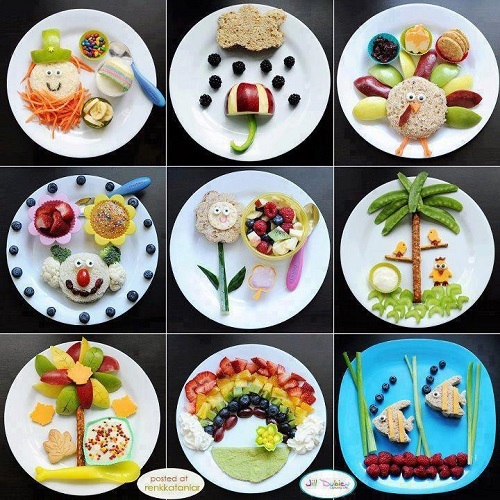 — Ashley S.
Finally, making food fun is always a great option — Be inspired!